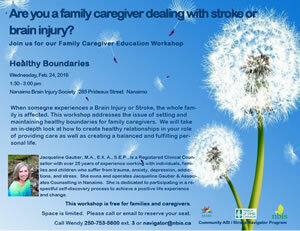 Are you a family caregiver dealing with stroke or brain injury? Join us for our Family Caregiver Education Workshop When someone experiences a Brain Injury or Stroke, the whole family is affected. This workshop addresses the issue of setting and maintaining healthy boundaries for family caregivers. We will take an in-depth look at how to create healthy relationships in your role of providing care as well as creating a balanced and fulfilling personal life. Jacqueline Gautier, M.A., E.X. A., S.E.P., is a Registered Clinical Counsellor with over 25 years of experience working with individuals, families and children who suffer from trauma, anxiety, depression, addictions, and stress. She owns and operates Jacqueline Gautier & Associates Counselling in Nanaimo. She is dedicated to participating in a respectful self-discovery process to achieve a positive life experience and change. This workshop is free for families and caregivers.